Last week, at the Developer Summit, we unveiled Server Object Interceptors. They have the same API as Server Object Extensions, and are intended to extend an ArcGIS Server with custom capabilities. 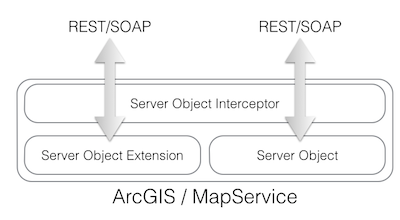 An SOI intercepts REST and/or SOAP calls on a MapServer before and/or after it executes the operation on an SOE or SO. Think servlet filters. A use case of an SOI associated with a published MXD is to intercept an export image operation on its MapService and digitally watermark the original resulting image. Another use case of an interceptor is to use the associated user credentials in the single-sign-on request to restrict the visibility of layers or data fields. This is pretty neat and being the BigData Advocate, I started thinking how to use this interceptor in a BigData context. The stars could not have been more aligned than when I heard that the MemSQL folks have announced geospatial capabilities in their InMemory database. 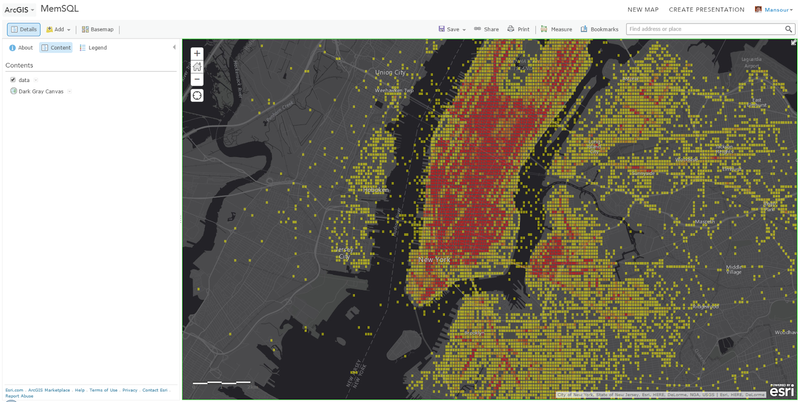 See, I knew for a while that they were spitballing native geospatial types, but the fact that they showcased it at Strata + Hadoop World made me reach back to them to see how we can collaborate. 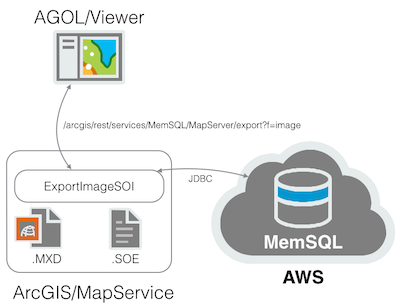 The idea is that since ArcGIS server does not natively support MemSQL, and since MemSQL natively supports the MySQL wire protocol, I can use the MySQL JDBC driver to query MemSQL from an SOI and display the result in a map. The good folks at MemSQL bootstrapped a set of AWS instances with their “new” engine and loaded the now-very-famous New York City taxis trips data. This (very very small) set consists of about 170 million records with geospatial and temporal information such as pickup and drop off locations and times. Each trip has additional attributes such as travel times, distances and number of passengers. It was up to me now to query and display dynamically this information in a standard WebMap on every map pan and zoom. What do I mean by “standard” here, is that an out-of-the-box WebMap should be able to interact with this MemSQL database without being augmented with a new layer type or any other functionality. Thus the usage of an SOI. It will intercept the call to an export image operation with a map extent as an argument in a “stand-in” MapService and will execute a spatial MemSQL call on the AWS instances. The result set is drawn on an off-screen PNG image and is sent back to the requesting WebMap for display as a layer on a map.